How beautiful is this mini hoop?! Today we feature Jessica of Thimble Thistle on Friday Instagram Finds. Her feed is filled with the most lovely mini hoop necklaces (from @Dandelyne) that are miniature replicas of masterpieces, pets, animals, and other adorable motifs. You can buy her masterpieces in her shop. 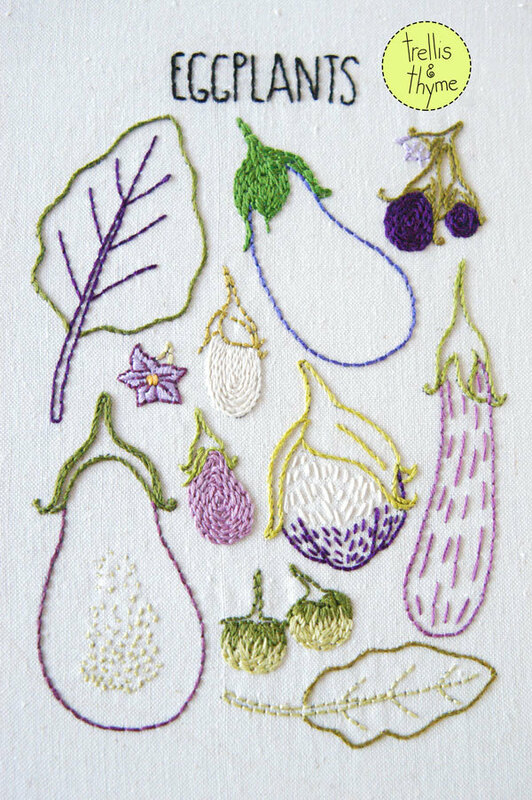 I am loving this wonderful Eggplant Sampler pattern in Trellis and Thyme's Etsy shop. I really enjoy the delicate, subtle hues they've chosen for this pattern - beautiful! Hello stitchy friends! I hope you've had a great week :) Today we're featuring @sweetaddiebeth. Laura makes state hoops embellished with pretty florals and personalized hoops. I especially like her "I promise to put a smile on your face every day" hoop. 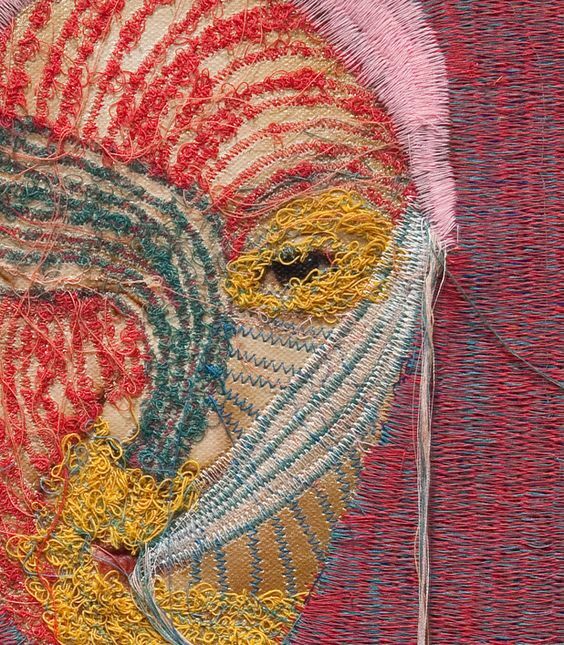 The colors are so pretty, and her stitching is beautiful. You can find out more about Laura and her shop Sweet Addie Beth on her Instagram feed and Etsy shop. Have a two year anniversary coming up? The traditional gift is cotton, and these stitched wedding vows are so sweet! Want to be featured on Friday Instagram Finds? Tag your best stitch-related photos with #feelingstitchyig! 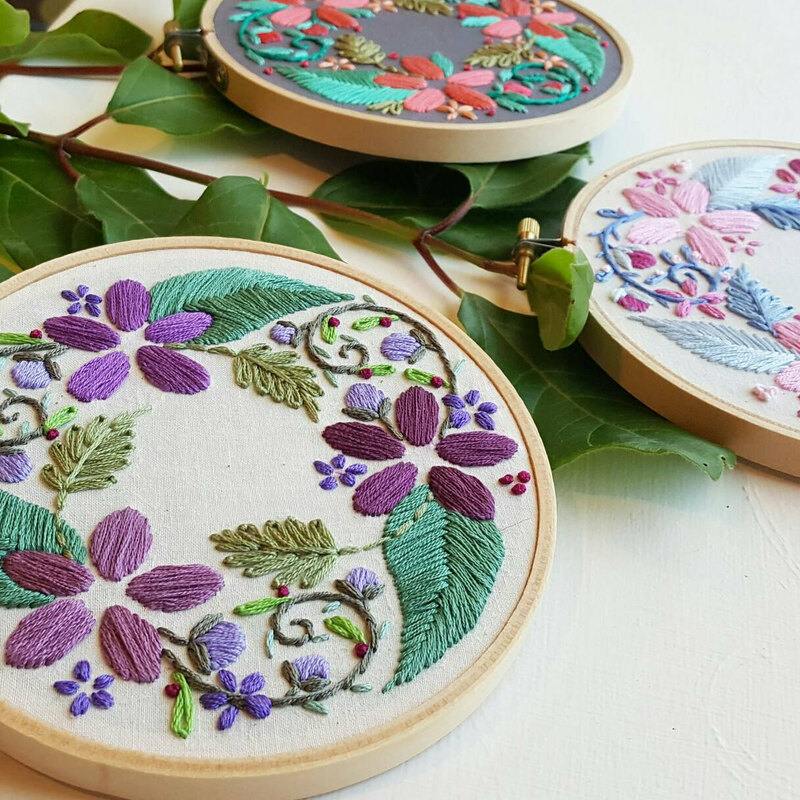 I've been admiring the gorgeous handwork of Namaste Embroidery for some time, so I was quite excited to see this lovely Floral Wreath PDF Pattern in her shop. This would make a perfect sampler for a birth or a wedding, or just something beautiful for yourself. 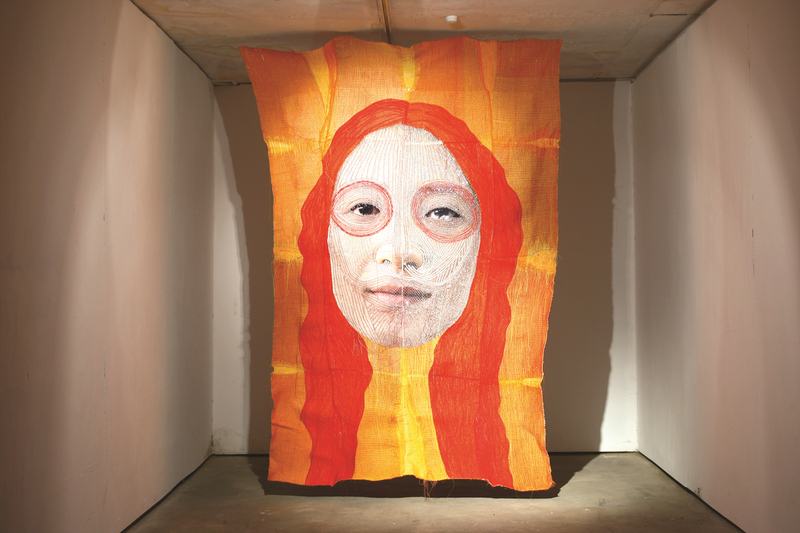 Yoon Ji Seon's 'Rag Faces' stare at you in vividly appealing colours that draw your eye in. 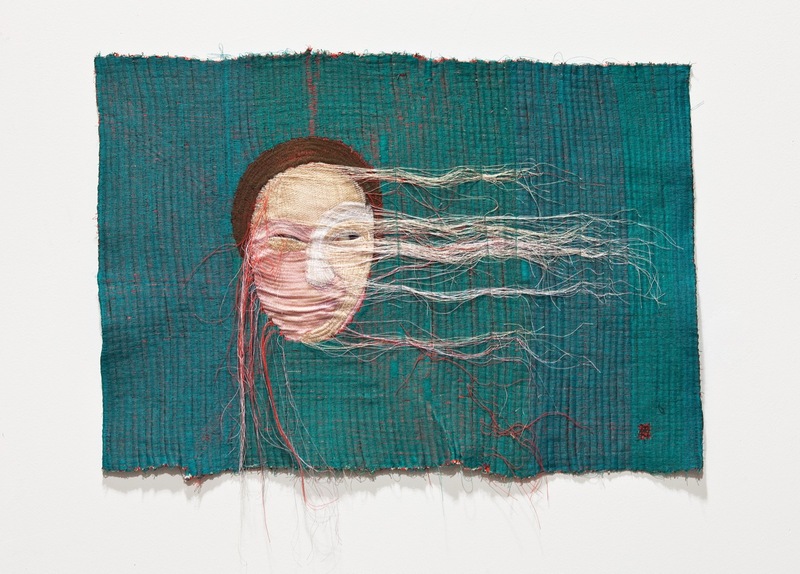 Her series 'Rag Face' is an accumulation of three years of her work and has been on show at New York's Yossi Milo Gallery last year and the Gallery at BRIC House earlier this year. "I didn’t just want beauty. I’m not against beauty, but I didn’t want to put a general beauty inmy work. I wanted to put some humour. One of my nephews, when he saw the work, said, “Aunt, you have noodles coming out from your nose.” It was fun, and I wanted to put some humour in it." Stitching by hand and with her sewing machine, layer after layer rich textures are constructed. The layers of thread are combined and unite to create new tones and shades. 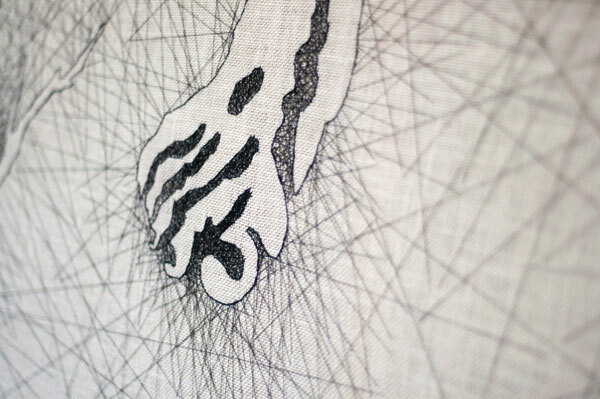 The direction of stitches are changed to create shadows, depth and dimension in her pieces. 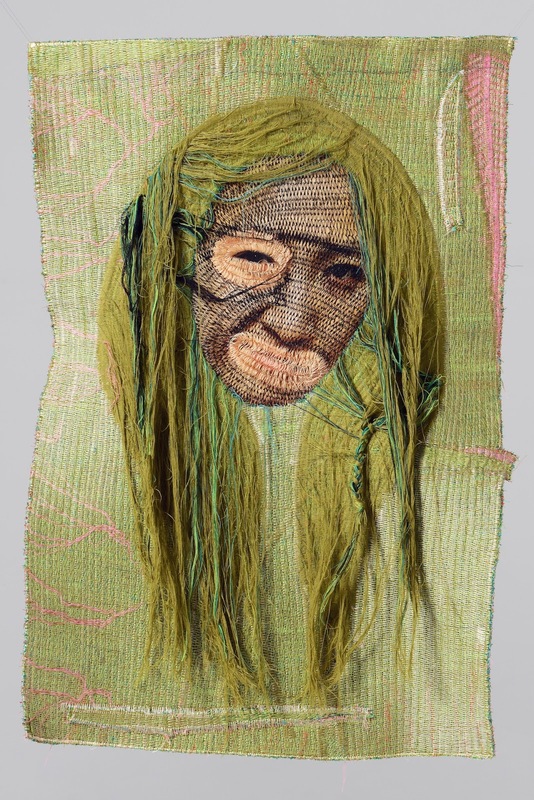 Yoon Ji Seon openly and humorously explains how she began working with the sewing machine and how she developed her style. "I never learned how to sew with a sewing machine. I tried to make stitches, and I made lot of mistakes. I mostly learned from the mistakes. It’s not normal sewing, like for clothes. It’s very different from that kind of sewing. The sewing machine broke many times. The man who fixes the machine insisted that I stop. I was torturing the sewing machine. It’s not a common way to use it. At the beginning, I’d stitch by hand, but those were small pieces. Now that my work is getting bigger and thicker, I mostly use the machine." Yoon Ji Seon talks about her working process where she often works throughout the night. 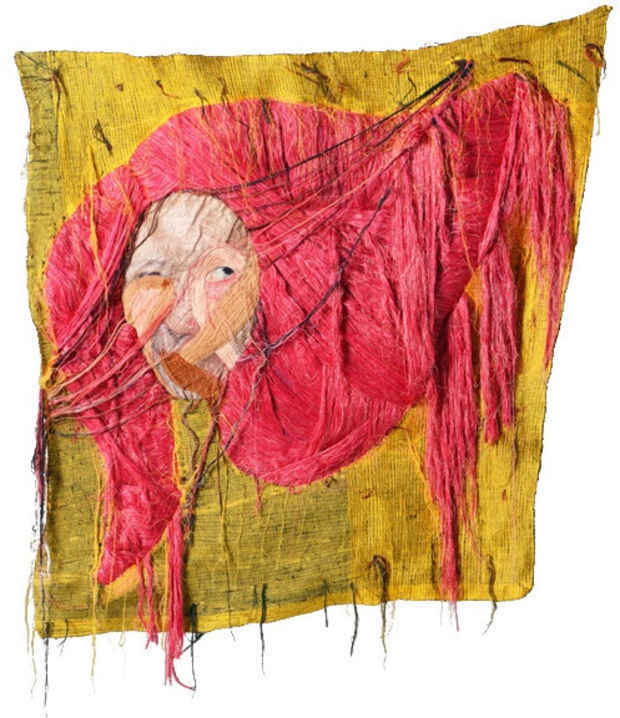 Her studio environment was very compact and she didn't have enough space to lay out her larger pieces of artwork whilst sewing at the machine and would frequently have to roll up her work and continue to stitch from memory. "I had to roll it while I was working. My room is very small, so I couldn’t unroll it to see the work. I had to remember everything I did. That’s why I couldn’t stop working and that’s why I didn’t sleep." In Korean culture it is regarded a taboo to ornament or cover your body, for example with paint. 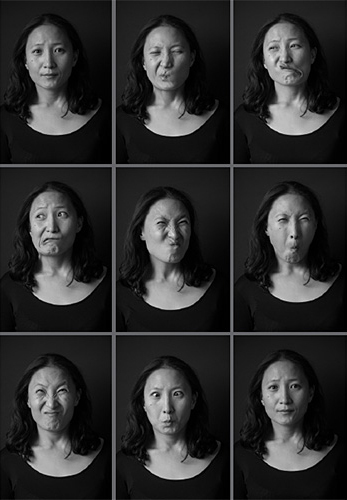 Yoon Ji Seon's work has previously shocked local audiences as they struggle to can't understand her work and are fearful of it. Yoon Ji Seon states that "We think that hurting our body or destroying our body is not beautiful and very disrespectful to our parents.... It’s a taboo. I once planned a solo exhibition but it was cancelled because people were scared of what I did." 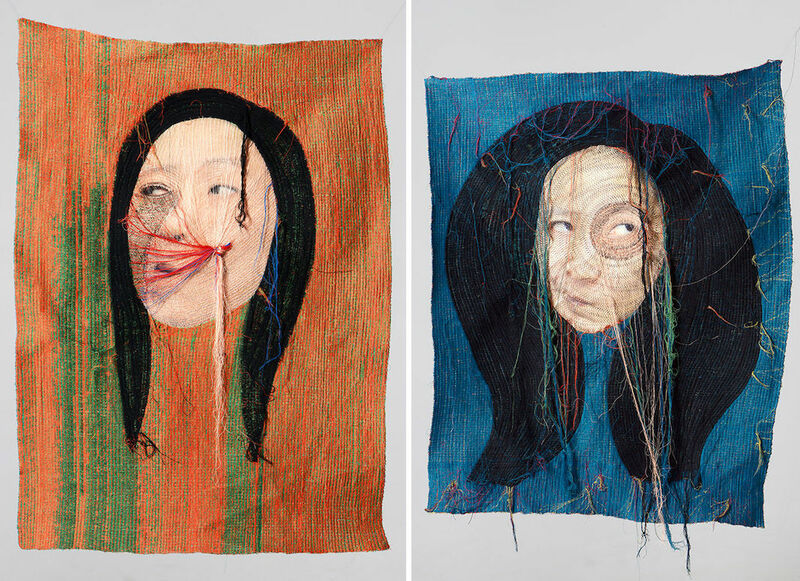 I feel warmed by Yoon Ji Seon's striking 'Rag Faces' which are full of character and intrigue. I hope you enjoy them too! Good morning! This Friday we're featuring @lolliandgrace. Anne's Instagram feed is so colorful and beautiful! Her pictures are gorgeous and beautifully staged. I adore her Lady Flower Crown hoops that use appliques using pretty fabrics to add visual pop. You can find out more about Anne and Lolli and Grace on her Instagram feed and Etsy shop. Handmade tassels, a hamsa and colorful embroidered flowers...this lovely pendant necklace is in the shop now. Click on the link in my bio to see it! Oh, so happy to be stitching a few of these hoops this morning. Truly happy. Remember the Lady Flower Crown hoops? They will be in the shop tomorrow! Until then you get LFCH (Lady Flower Crown Hoop) spam, er, sneak peeks today. Hello, Stitchers! 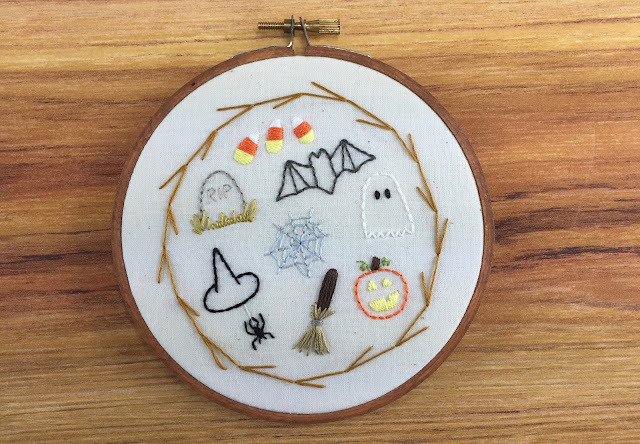 Our regular Friday Instagram Finds author, Amy from Random Acts of Amy, is offering a free Halloween Sampler pattern over on her blog. 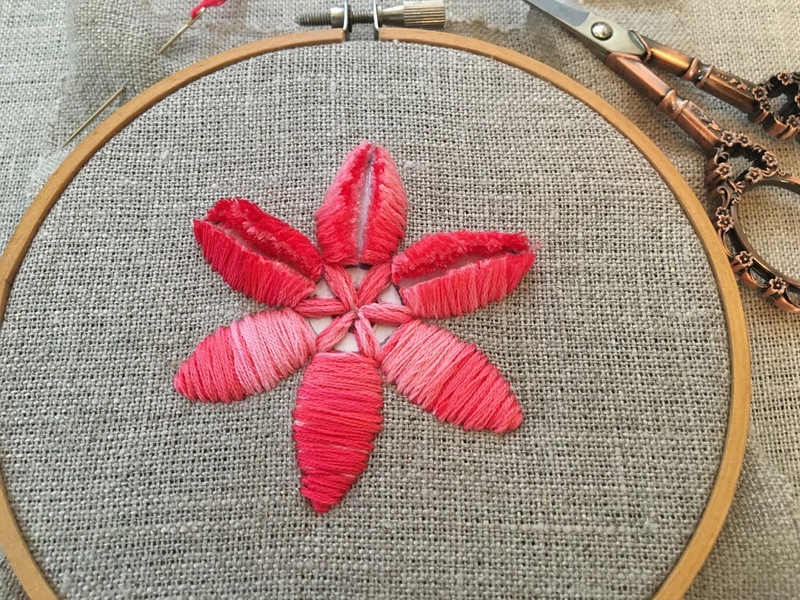 This is her very first pattern and it is wonderfully detailed - with a full guide to colors, stitches, and number of strands to use. She'd love to see you stitch it up! Follow the link above to get the pattern. 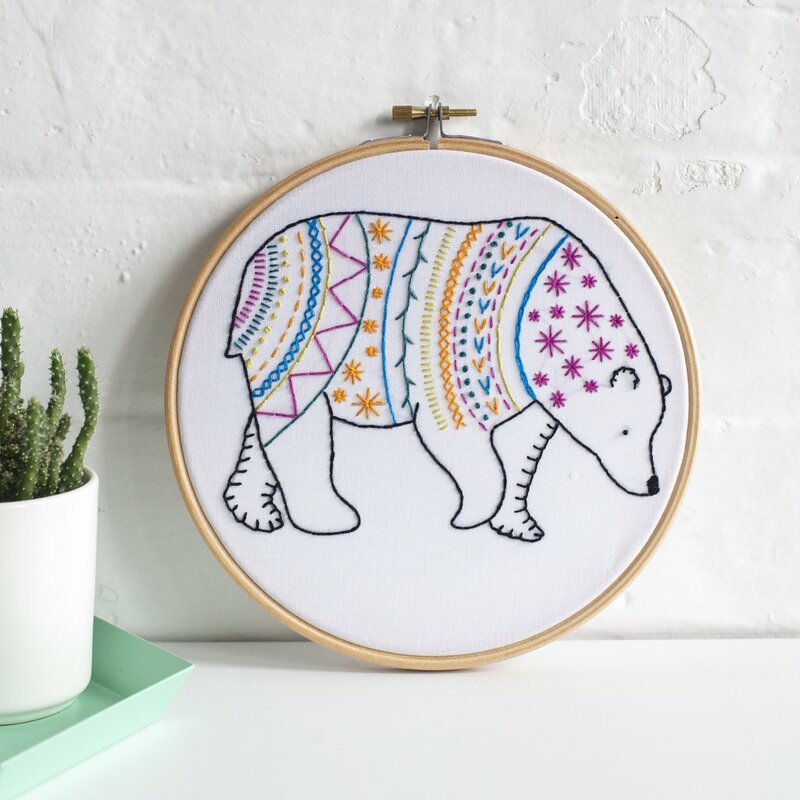 I adore the colors and stitches in this lovely Bear Embroidery Kit. The kits by Hawthorn Handmade look so detailed and a great place to start your stitching or a small side project for the more experienced stitchers. Hello - it's Fri-YAY! This Friday we're featuring Steph and her Instagram feed @ohsewbootiful. Steph lives in Blackpool in the United Kingdom. Steph creates modern and fun embroidery kits and needlework patterns, and her kits come with everything you need to complete them. You can find out more about Steph and Oh Sew Bootiful on her Etsy shop and Instagram! Do you want to be featured on Friday Instagram Finds? Tag your best stitch-related photos with #feelingstitchyig! 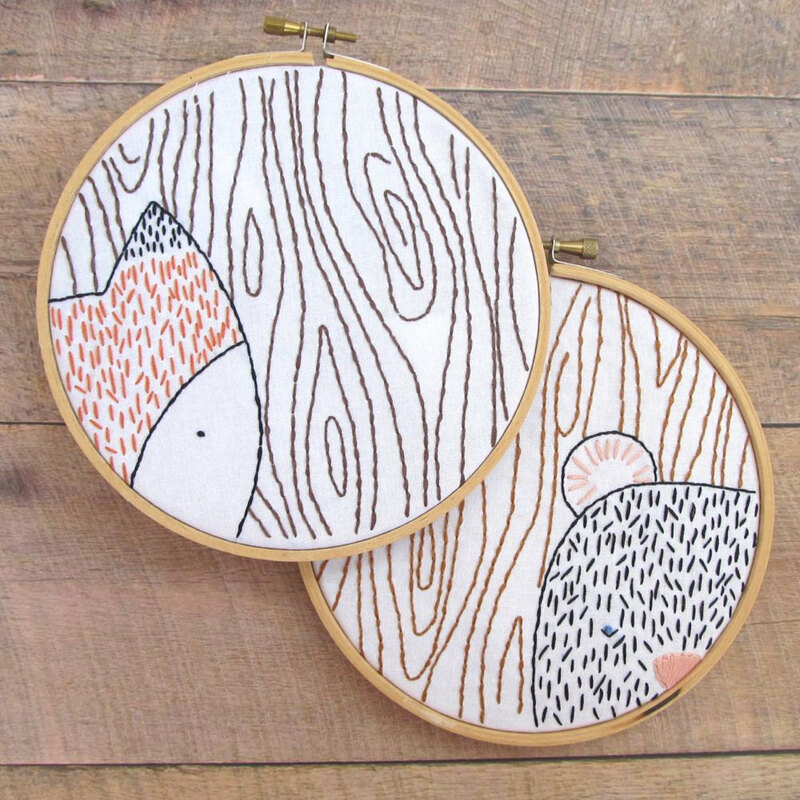 How adorable is this Fox and Bear pairing on Etsy by SweaterDoll? The shop also offers a pre-printed fabric design of the two, if you'd like to save yourself a fabric transfer. Sweetly simple and a fun-looking stitch for beginners. 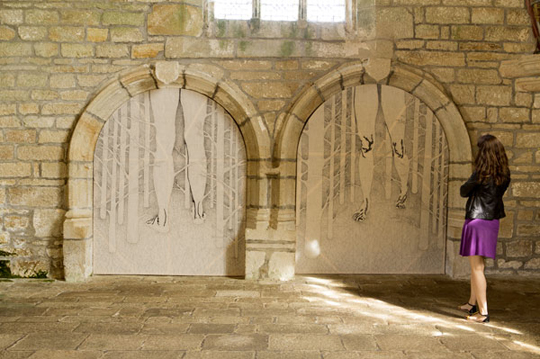 The French artist Nastasja Duthois explores silhouettes and shadows with needle and thread. 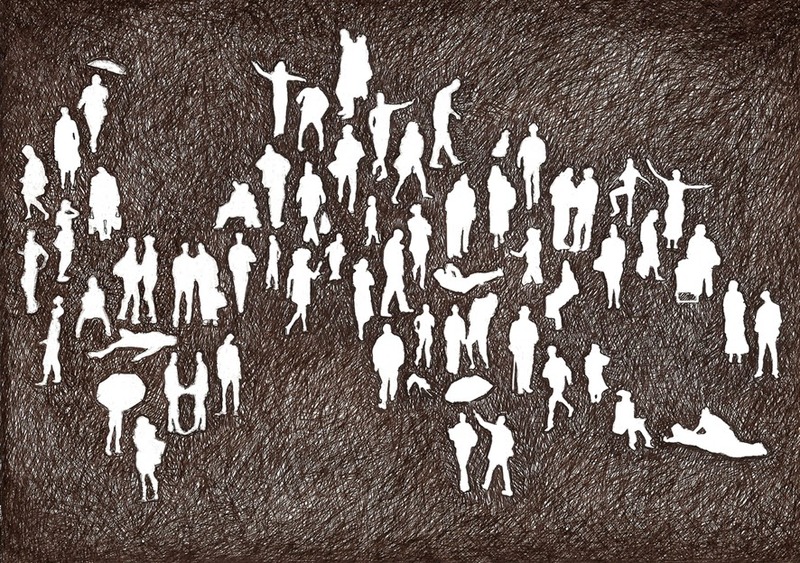 Common themes occurring in her work are people, landscapes and animals and she likes to express the fleeting moments and surprises in everyday life. Nastasja creates beautiful line work in her unique style, often transferring techniques adopted with the pen such as cross hatching with thousands of individual hand stitches. Currently exhibiting in Auray, France, it's exciting to see what she will produce next. Last week, I posted about plushwork with tapestry wool. 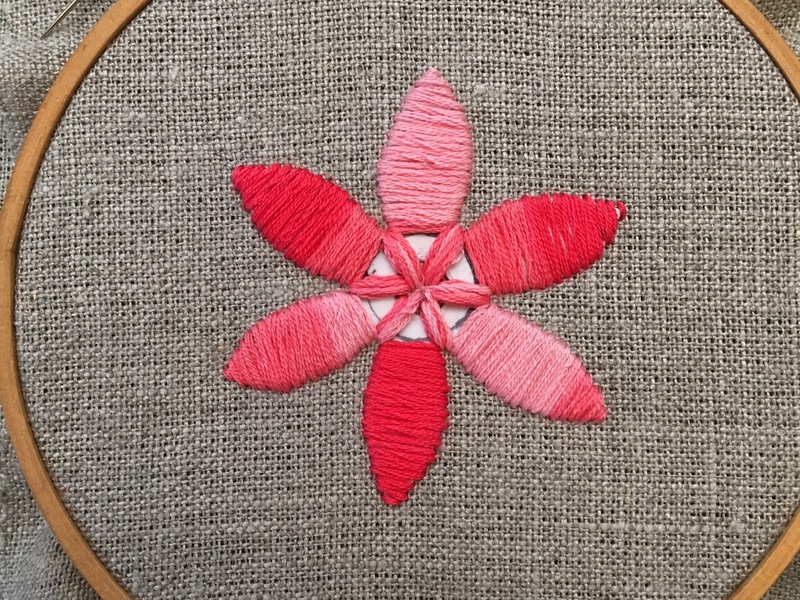 I decided to try the same technique with six strand cotton embroidery floss and thought I would share a quick post about how it turned out! I used the same template and a variegated pink floss. Half way through my first layer of satin stitches - so far I like how it looks with the variegated pink. I completed 4 layers of floss on each petal. Once again - the fun part - cutting through the layers. Here is what it looks like after. I really like the end result with the embroidery floss! I also thought it was easier to stitch with the floss than wool, since wool is much more bulky, but I am also new to wool stitching. I see lots of possibilities of using this technique to add more dimension to my stitching too. What do you think? 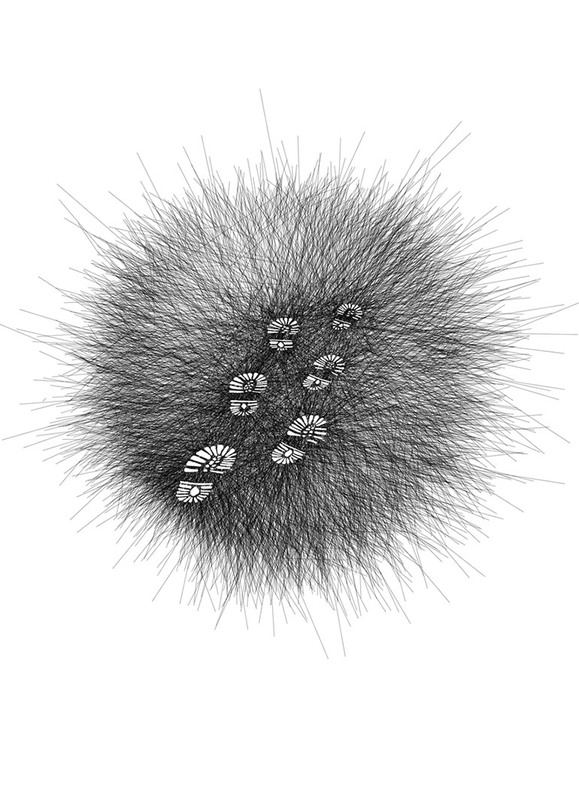 Which version do you like better - cotton floss or wool? Good morning, stitchy friends! This Friday we're featuring @plaidlovethreads. 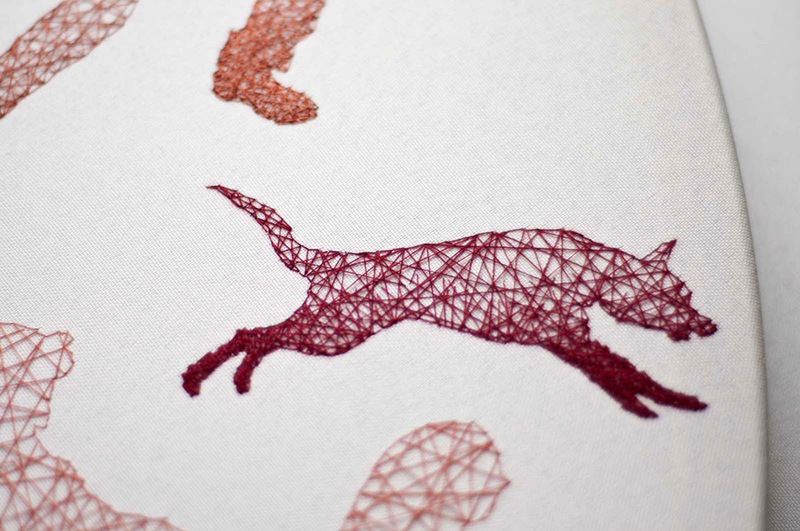 Valerie creates bright and colorful embroider. Valerie is based in the Bay Area, and - fun fact - used to be a Disneyland Tour Guide! I really like her necklaces where she layers lace and adds pretty embroidery. You can find out more about Valerie and Plaid Love Threads on her Etsy shop and Instagram!